More than 10 million people in the UK complain of headaches, making them one of the most common health complaints. It is unusual not to have at least the occasional headache. 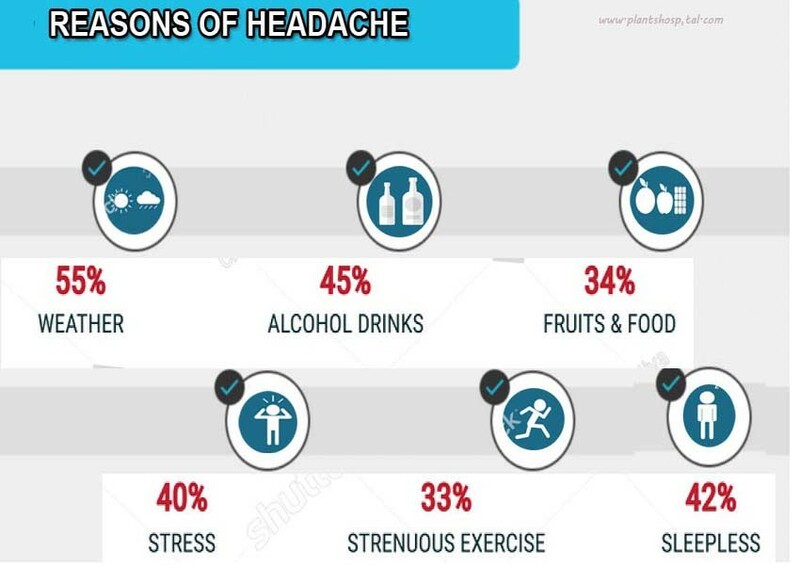 The good news is, most are easily treated, as the majority of headaches are not serious and can be aided by simple lifestyle measures like drinking enough water, ensuring you get enough rest, and through the sensible use of over-the-counter painkillers. 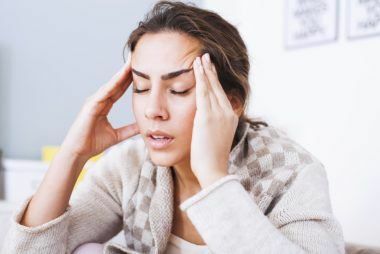 While headaches can be caused by medical conditions, injuries, or infections, they are sometimes not due to a specific disease or other identified medical condition. The three most common of those types of primary headaches aretension, Cluster, and Migraine headaches. These are caused by muscle tension in the shoulders, neck, and head. The tension may come from fatigue, an uncomfortable body position, or emotional stress. Tension headaches typically begin in the morning or early afternoon and can get worse during the day. They often involve a tight pressure feeling like a band around the forehead, but pain may spread over the entire head and downward into the neck and shoulders. These types of headaches can be very painful. The intensely sharp pain usually involves one side of the head and spreads around the eye. Cluster headaches start suddenly and generally last about an hour. Attacks come in groups hence the name “cluster” occurring several times a day or each week and continuing for 6 to 8 weeks. Often marked by intense throbbing head pain. Blurred vision with shimmering light specks, dizziness or nausea. sensitivity to light, sound, or odors. Migraines are certainly a different type of headache. Headaches that are related to other physical conditions or illnesses are often referred to as secondary headaches. These headaches may result from any number of common causes, including high blood pressure (hypertension), eye or sinus problems, and facial structure disorders. As the blood vessels and circulatory system throughout the body are affected by high blood pressure, headaches may result. The pain is typified by a throbbing sensation throughout the head, though the headaches are generally not chronic in nature. Sinus congestion or builtup pressure in the eyes due to glaucoma are examples of the types of physical problems that can occur with your eyes, ears, nose and/or throat that result in headaches. These headaches will often disappear when the underlying condition is effectively treated. One such disorder (originally known as temporomandibular joint or TMJ syndrome), now known as myofascial pain dysfunction (MPD), is characterized by a dull aching pain in and around the ear that is associated with chewing food. The pain may radiate to the side of the scalp causing a headache. Difficulty opening the mouth or a clicking/popping sound in the jaw joint may also be present. Once symptoms are recognized, treatment can be effective. Can also be caused by other serious medical conditions such as trauma to the head or brain, accumulation of blood in and around the brain, infections or a tumor. Whether primary or secondary in nature, headaches can be both painful and distressing for those who suffer. It is important to keep in mind that the vast majority of headaches are not an indication of a serious medical condition. Headaches happen to millions of people every single day. Allergies, including food allergies. People who suffer from frequent headaches may be reacting to certain foods and food additives, such as wheat, chocolate, monosodium glutamate (MSG), sulfites (used in restaurants on salad bars), sugar, hot dogs, luncheon meats, dairy products, nuts, citric acid, fermented foods (cheeses, sour cream, yogurt), alcohol, vinegar, and/or marinated foods. Hunger and/or hypoglycemia (low blood sugar). Diseases of the eye, nose, and throat. Hormonal imbalances, including hormonal fluctuations found in premenstrual syndrome (PMS), menopause, pregnancy and postpartum (after the baby is born), and hormone or estrogen replacement therapy (HRT/ERT) and the use of birth control pills, patches, or injections. Brain disorders, such as tumors. Drug use and drug side effects. Toxic overdoses of vitamin A, vitamin B deficiency. Exposure to irritants, such as pollution or chemical fume exposure, perfume, or after-shave. Dehydration can also cause headaches, often accompanied by a feeling of being flushed, a warm face, and a sense of heaviness in the head. Peppermint is one of the best known natural herbs. Traditionally, peppermint has been used in beauty products. 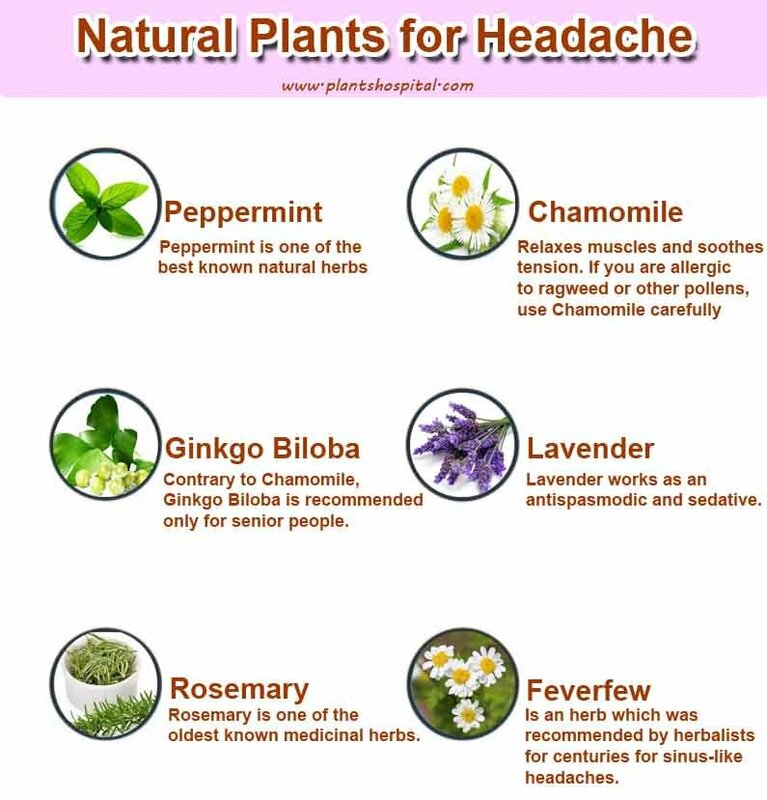 However, people are starting to realize that this herb is also a powerful headache treatment. You can add peppermint to your tea or apply it directly to both of your temples. In addition, you can add a few drops of the peppermint essential oil in some hot water and inhale the steam. Relaxes muscles and soothes tension. If you are allergic to ragweed or other pollens, use chamomile carefully. A salve made from Ginger, Peppermint Oil, and Wintergreen Oil rubbed on the nape of the neck and temples can help relieve tension headaches. For sinus headaches, rub the salve across the sinus area. Avoid the eyes. Contrary to Chamomile, Ginkgo Biloba is recommended only for senior people. Younger people using Ginkgo Biloba as a headache treatment may find that condition is worsened. Ginkgo Biloba can be taken in the form of a pill or you can add it to your tea. In addition, the nuts that come from the Ginkgo Biloba are also effective in pain relief. You can add these nuts to your soup or porridge. To conclude, Ginkgo Biloba is a great pain killer but you need to know at which age it is recommended to consume it. Lavender works as an antispasmodic and sedative. This herb has been widely used to relieve headaches, reduce hysteria and stress, eliminate insomnia, soothe muscle aches, bug bites, rashes, colds, chest infections, and rheumatism, and even reduce flatulence. The sedative effects of Lavender have been well documented in medical studies and found to be effective in reducing caffeine induced hyperactivity. Rosemary is one of the oldest known medicinal herbs. It was most commonly used to enhance mental functions. The Greeks used it to improve memory. In Medieval times, Europeans were said to have used the herb for mental acuteness and increased intelligence, but it was also used as a cardiac and kidney tonic. Rosemary increases blood flow to the muscles, head, brain, and is effective in reducing the toxic effects of stress. In Europe it is used as an aid to liver function and is particularly useful for ameliorating liver congestion and inflammation. In addition to helping the heart and liver, Rosemary also helps reduce high blood pressure. Other common uses include the treatment of “nerves”, digestive disorders, gas, palsy, weak memory, dizziness, migraine, dandruff, jaundice, consumption, and menstrual pains. Rosemary can also stimulate hair growth, restore appetite, and improve sight. Taken in powdered form, it is a helpful remedy for migraines. Is an herb which was recommended by herbalists for centuries for sinus-like headaches. Modern science has identified aspirin-like compounds which could reduce inflammation. Do not use Feverfew during pregnancy. Root is a good sedative to take during a headache. Valerian is a calmative and tranquilizer. It has been used at least since the time of Hippocrates (460-377 B.C.E.) for treating headaches, insomnia, nervousness, restlessness, menstrual problems, nervous stomach, and hysteria. Clinical trials have confirmed the use of valerian for treating insomnia, especially the insomnia that accompanies menopause. The advantage of valerian over tranquilizers such as Valium and Xanax is that it reduces sleep latency, the time required to fall asleep, without a period of bedtime drowsiness and without creating a “hangover” or grogginess the next morning. Precautions – If you use valerian for several months, you may experience withdrawal symptoms (headache, insomnia, racing heart, and general grouchiness) if you stop using the herb abruptly. Reduce dosage of a period of about a week if you wish to discontinue using the herb. Valerian itself does not cause side effects, but it may increase the side effects of some of the older medications for insomnia, such as Ativan (lorazepam), Valium, (diazempam), or Xanax (alprazolam). You probably use ginger already in many dishes. Now you might want to use it to fight your headache. Ginger is especially effective for those headaches that seem to pound in your forehead. You can add it raw to your tea or to your meal. It is also available in powder. Ginger has been shown in several studies to be helpful for pain relief. Honey and lemon. Peel the ginger root and slice it into thin slices. Bring the water to a boil in a saucepan. Once it is boiling, add the ginger. Cover it and reduce to a simmer for 15-20 minutes. Strain the tea. Add honey and lemon to taste. Note: Keep in mind that if you are making this tea to strengthen the immune system and ward off colds and flu, sweeteners are not recommended. Is good for sinus headache. Jamaican Dogwood is considered a relatively powerful remedy for migraine and neuralgia. The herb is also used to treat ovarian and uterine pain. The main use of the herb, however, is to treat insomnia caused by nervous tension or pain. Can be used in treating allergies such as asthma, hay fever, eczema, and nettle rash. This herb is used to treat fevers, coughs, and gastrointestinal infections that bring on diarrhea. It also works as an appetite stimulant. This herb also increases the volume and flow of urine and is therefore helpful in treating urinary and kidney problems. Baical Skullcap acts as an antispasmodic agent and has a sedative effect. It is used to calm nerves, distress, and or irritation. It also improves circulation, lowers blood pressure, and is useful in treating arteriosclerosis and varicose veins, and also helps prevent blood clots. It is good for headaches related to muscular tension and spasms. Has been used extensively for the high thymol, phenol, and carvacol content in Thyme oil. Thyme leaf is also a popular culinary herb. Thyme (Thymus vulgaris), a sweet smelling herb, has been used traditionally for common winter aliments. To help prevent headaches, eat small meals and eat between meals to help stabilize wide swings in blood sugar. Include almonds, almond milk, watercress, parsley, fennel, garlic, cherries, and pineapple in your diet. Try eliminating foods containing tyramine and the amino acid phenylalanine. Then reintroduce one food at a time and see which one produce headaches. Phenylalanine is found in aspartame (Equal, NutraSweet and other products), monosodium glutamate (MSG), and nitrites (preservatives found in hot dogs and luncheon meats). Foods that contain tyramine include alcoholic beverages, bananas, cheese, chicken, chocolate, citrus fruits, cold cuts, herring, onions, peanut butter, pork, smoked fish, sour cream, vinegar, wine, and fresh-baked yeast products. Tyramine causes the blood pressure to rise, resulting in a dull headache. Research shows that sleeping in a bedroom kept at a cooler temperature can help to prevent cluster headaches. Headaches are more frequent when environmental heat increases body temperature, which causes blood vessels to dilate. If you feel a headache coming on, drink a large glass of water every 3 hours until symptoms subside to reduce or prevent dehydration, which is often a cause of headaches, and to flush toxins from the body. Consume no cakes, chocolate, coffee, dairy products (except yogurt), packaged or canned foods, pies, soft drinks, sugar, tobacco, white flour products, or any junk food. Thanks for the sensible critique. Me my neighbor were just preparing to do a little research about this. We got a grab a book from our area library but I think I learned more clear from this post. I am very glad to see such wonderful info being shared freely out there.